The Belgian colors have been hoisted on Belgian flag poles for a while. 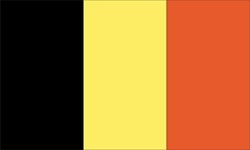 These colors currently displayed were first used in Belgium in the rising against Austrian rulers, who were in fact expelled in 1789. For a few decades following the country came and was under rule of the French. From 1814 till 1830 the country was united with the Netherlands. The Belgian colors were used by those to free themselves from this forcible union between the Belgians and the Dutch. These colors were first flown horizontal, but following independence the Belgian government decreed that they should be displayed vertically, like the French national flag, which is also called the "Tricolore." Click here for purchasable Belgian flags.